Se trata de la fiesta popular en honor al patrón de Sitges, Sant Bartomeu. 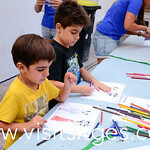 Family workshop to make puppets inspired by the Fiesta Mayor's popular dances, such as “Bastoners”, gypsies and devils. The workshop will be complemented with an optional visit to the Maricel Museum to contemplate the oil painting of Felip Masó, “La processó de Sant Bartomeu” (The San Bartolomé procession), 1884, as well as other paintings of the Luminist’s room. Organized by: La Saca - Sitgetana de Cultura i Animació. 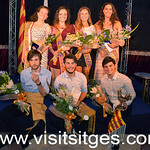 The “Barraques” group is formed by Agrupació de Balls Populars de Sitges, Ateneu Popular, Colla Jove de Castells de Sitges, La SACA (Sitgetana de Cultura i Animació, el Casino Prado Suburense and la Societat Recreativa El Retiro . Entertainment between performances by Dj Send0. The work of Blanca Planella i Rocha has been awarded with the Carbonell i Gener Award for high school students and is part of the “Col·lecció Quaderns, 66”. The presentation is given by Jordi Milà i Franco, member of the Board of the G.E.S. With musical performance by Andreu’s Quartet & Disco Marin. The Pubilla and Hereu del Retiro 2018 / 2019 will be announced that evening. There will be a gift for all ladies and gift draws during the evening. Menu price: € 45 (Retiro members € 35). Act organized by the Societat Recreativa El Retiro. By Mercè Garcia Campillo. At the end, announcement of the “Pubilla” and “Hereu” of Agrupació de Balls Populars de Sitges 2018 and member’s awards. The party will conclude with a glass of cava and refreshments. 21.30h On the "Plaça de l’Ajuntament "
Opening speech by Talino Plana, with simultaneous interpretation in Catalan sign language. 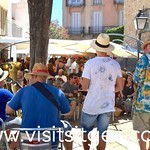 The Pregó (Festa Major Street Cry) will be broadcasted live at the Fragata. In the case of rain or bad weather, the proclamation will take place elsewhere to that be announced through the social networks. "Aida" opera by Giuseppe Verdi live from the Sydney Bay. Admission price: € 10. 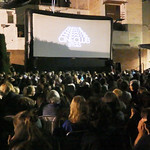 Tickets on sale at www.cineclubsitges.com and at the Cinema Prado box office. The music groups and artists, Justo, Raül Bonilla, Oshun, Ramzéh, Sergi Ramírez, Sergi Estella and Xarim Aresté, will act as a final party in the Retiro gardens, at 22.00h. 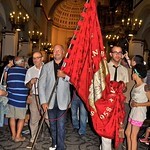 The Municipal Commission of the Festa Major de Sant Bartomeu and Santa Tecla, representing the municipal authorities, will recieve the icon of Sant Bartomeu from parish vicar Josep Pausas and to the sound of the Agrupació Musical Suburband of El Retiro, will parade it this year to Casino Prado Suburense (c/ Francesc Gumà, 6-14), place designated by the Pendonist, Tony Tudela Pérez. The route will follow the streets of Baluard, plaça de l’Ajuntament, Major, Cap de la Vila, Jesús, Francesc Gumà. To follow, inauguration of the exhibition of the image of Sant Bartomeu open until 21:00h. By Havaneres Xarxa. The typical "rom cremat" (burned rum) will be offered. Recognized with all the possible prizes within the panorama of Catalan independent music, the Badalona vocalist and the guitarist of Flix continue the chain of popular music transmission with their own songs. Price: € 9 Limited capacity. Tickets for sale at the Commission stand and at the Tourist Office. 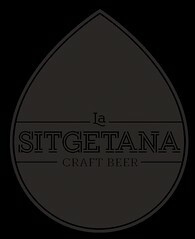 Ateneu invites all Sitgetans and Sitgetanas to share this moment and celebrate the arrival of the Fiesta with live music by the group Sidral Brass Band. We will dress La-hia and Fa-luch with the company of the children. with poems and singing of Sant Bartomeu "Goigs" (praises) by the “Amics de l’Orgue” chorus . This year, the author of the Poem of the Flag titled "Bon Viatge!" (Nice trip!) is the writing group “ Talleres de Texto” and the illustration that accompanies it is made by Iris Salamé. Followed by the musical group "Agrupació Musical Suburband del Retiro" parading to the home of the President of the "Commissió", Maica Díez-Alcón, on Santa Bárbara, 26. The event will be livened up by the music of the group Retrio. Organized by: Comissió de Festa Major with the collaboration of frutería Albert i Anna. The different groups offer their inaugural concert in tribute to the founders of the Festa Major. 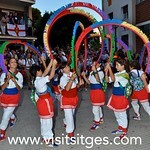 Participation of “grallers” of Escola de Grallers de Sitges, Marcets, La Sitja, Colla Maricel, Santa Madrona i Montònec (because of their 40th anniversary), and the groups of “sacaires”, Joan Olarte, Víctor Berbegal and Miquel Acunya. By Colla Jove de Castellers de Sitges in commemoration of their 25th anniversary. Starting at Plaza Ayuntamiento: Gegants, Cabeçuts, Drac, Àliga, Diables, Bastons, Cercolets, Panderetes, Pastorets, Cintes, Gitanes and Moixiganga, accompanied by the musical group Suburband Retiro. 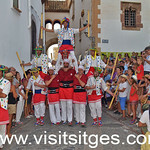 At the Cap de la Vila, the Moixiganga will perform the complete dance. 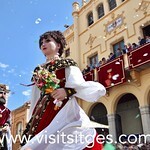 Arriving at Hort Can Falç, In honor of the authorities and the citizens, all the groups will perform the full dances and there will be “Balls Parlats” (speeches/recitation of verses): Ball de diables, Ball de Cercolets, Ball de Gitanes and Ball de Pastorets). 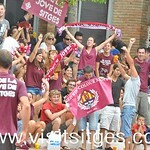 By Colla Jove de Castellers de Sitges. The group of traditional dancers and musicians and the authorities, will recover the shrine of Sant Bartomeu from the place designated by the “pendonista” of the Festa Major 2018, Mr. Tony Tudela Pérez, and and they will accompany it to the parish church. Route: Santa Bárbara, plaza del Pozo Vedre, Parellades, Cap de la Vila, Sant Francesc, Sant Gaudenci, Francesc Gumà, Jesús, Santiago Rusiñol, Barcelona, Davallada, carrer d'en Bosch, plaça del Ayuntamiento and Baluard. In front of the doors of the parish church, the popular dances receive the image of Sant Bartomeu which, accompanied by the authorities, the “Pendonista” and “Cordonistes” will be placed in the presbytery to preside over the liturgies of the festival. By Pirotècnia Igual S.A. and artistic design by Isidre Pañella i Virella. Honorary Citizen of Sitges. 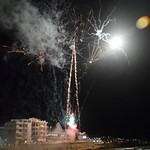 During the pyrotechnic show, a seating area will be set up, where attendees will enjoy a tasting of a glass of cava Maria Casanovas Brut de Brut. Price: 5 euros. 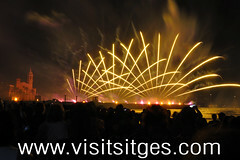 Tickets for sale at the Commission stand and at the Sitges Tourist Office. Collaboration: Perbacco and cava Maria Casanovas. Parade to El Greco Monument and back to Carrer Nou. With Orquesta Taxman, guaranteeing a night of rhythm and “sabor”, and the internationally recognized, Sitges DJ, Nuria Scarp. The "matinal" begins early in the morning, and the folkloric dances and musicians with the “charanga” Buskant el To, follow an itinerary through the streets of town while flowers are handed out to lady spectators by "la Comissió de Festa Major". People can join in the "ball de faixes" (one must be dressed in white and wear "espardenyes de betes" (espadrilles with ribbons) and a "faixa" (waistband in the fashion of the castellers). Route: Baluard, Fonollar, Baluard Vidal i Quadras, Port de n’Alegre, Rafel Llopart, Sant Damià, Sant Sebastià, Jesús, Sant Bartomeu, Sant Gaudenci, Sant Josep, Espalter, plaça del Pou Vedre, Parellades, Cap de la Vila, Major and Ajuntament. Presided over by Father Josep Pausas, rector. This year, the group Colla Jove de Castellers de Sitges, will make the offering to Sant Bartomeu commemorating its 25th anniversary. At the end of the celebration, song of the “Goigs” (praises) of the Saint in charge of the Choir of the Amics del Orgue and veneration of the relic. Musical parade of the Band, which will accompany the authorities to the Town Hall. Then, all the dances and their respective musicians will perform, together with the Cobla Maricel and the Suburband del Retiro Music Group, they will come together in one of the most magical moments of the festivities. After the performance of the popular dances, the band will perform "Els Segadors", the national hymn of Catalonia. 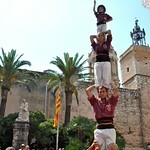 Performed by Colla Jove de Castellers de Sitges. Casino Prado Suburense, Cobla Maricel will perform “Concert per cobla & gralles”. Sociedad Recreativa El Retiro with the performance of Agrupación Musical Suburband del Retiro. Circuit around town with the authorities, the Saint and the folkloric dances and musicians, accompanied by all the Sitgetanas and Sitgetans who wish it. The rector of the parish, Mn. Josep Pausas y Mas will preside over the processional act joined by the Illustrious Town Hall dignataries. The popular dances, grallers and the Suburband del Retiro will precede the tabernacle. 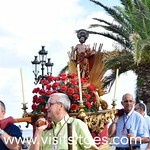 The tabernacle, with the image of the Saint, will be taken by the “Costaleros” of Sant Bartomeu and Santa Tecla. The Flag of Sant Bartomeu shall be carried by the pendonista Tony Tudela Pérez, who has named as Cordonistes Vinyet Tudela Aledo, Gerard Ferrer Cuellar, Isaac Bielsa Tutusaus and Josep M. Marrades Puig. Route: Baluard, Fonollar, Sant Joan, Davallada, Barcelona, Santiago Rusiñol, Jesús, Sant Bartomeu, Sant Gaudenci, Sant Francesc, Cap de la Vila, Parellades, Bonaire, passeig de la Ribera, Nou, Major, plaza de Ayuntamiento and Baluard. 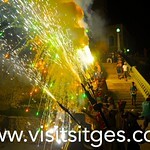 As the procession advances along the Paseo de la Ribera, the religous procession will be saluted by firing mortars and the ringing of bells, La Cobla Sitgetana will interpret the sardanas “Els Gegants de Sitges” composed by Tomàs Gil i Membrado and “La Processó de Sant Bartomeu”, composed by Antoni Català i Vidal. 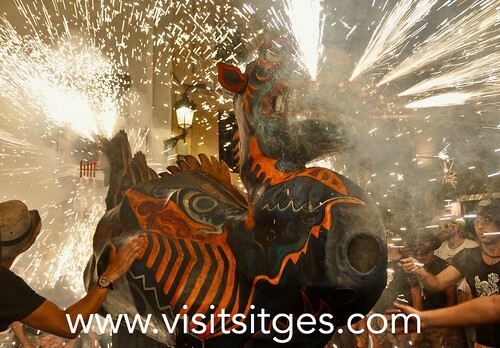 When the Saint is being returned to the parish church, in the plaza del Baluard in front of the church all the fires and crackers are lit, the dances are carried out to their respective music and a small firework display takes place. It is, in all probability, one of the most emotional and awe inspiring moments of the fiesta. Then, inside the temple, closing prayer. 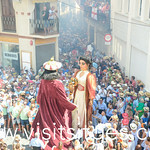 With the Saint restored to the parish church, the gegants, drac and àliga (papier-mâché giants, dragons and eagle) dance their farewell at Plaça de l'Ajuntament. With Falciots Ninja, Ramon Mirabet and dj’s Kimberly i Clark. The event will feature a performance of group “Les Guineus del Dixie”. A new vermouth "India", will be served. Organized in collaboration with Bar Restaurant La Guineu . 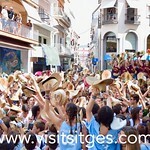 We are invited to remember those who, with us, lived the Sitges Fiesta with joy. 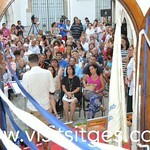 With the introduction of “Pubilles” of Casino Prado and Carrusel and the “Hereu” of Carrusel. With Momo (Queen Tribute), Coldday (Coldplay Tribute) and Dj Coco. With the groups of Minyons de Terrassa, els Xicots de Vilafranca and Colla Jove de Castellers de Sitges. A cargo de Josep Delgado. With Cobla Maricel. We will say goodbye to the Fiesta Mayor with cake and sweet wine. Sabor de Gràcia with the show “Sabor a Peret”, and la Welcome Band Orquestra. 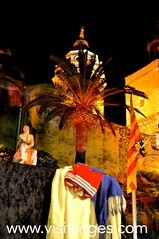 The piece of the mont is “El Ball de Gitanes de Sitges” (Ball parlat). By JM. Esteban.